In 1845, 129 brave crewmen set out to find the elusive Northwest Passage. These men were the most prepared, technologically advanced expedition of their time, confident that if the Northwest Passage existed, they were the ones who would find it. Unfortunately, the Franklin’s Expedition’s legacy was one of the longest searches for missing naval ships. Terror and Erebus proved elusive for over 170 years. 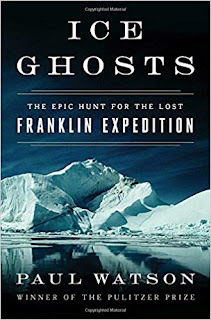 Watson tells this amazing story of the hunt for Terror and Erebus from the inception of Franklin’s expedition, to the amazing persistence of Franklin’s wife in order to recover his body, to the modern expeditions in the 1960s and beyond in search of the lost ships. Learning of the thought and science that went into creating this expedition was absolutely fascinating. Fresh ideas such as inflatable boats, canning, and the need for entertainment during long periods of extreme suffering were all implemented on this journey making it a cutting edge expedition. When it became clear that something had gone terribly wrong, mission after mission sought to find the ships for decades, making it one of the greatest navel searches in history. Decades later, people were still trying to find out what had become of the Franklin Expedition. One such person, an Inuit historian, Louie Kamookak, made amazing strides in plotting the location of the Terror and Erebus wrecks by listening to Inuit oral history and cross examining it against the intended route. With the help of Inuit oral history, modern technology, the invention of scuba, and so much more, great discoveries were made over 170 years after that fateful voyage set sail. This story lends itself to paper quite well, and Watson does a great job melding the old stories with modern day discoveries. I particularly enjoyed the Inuit perspective considering the land Franklin was exploring has always been theirs. Who better to know what happened than the people who know the land best? If you are interested in Franklin’s expedition, Michael Palin from Monte Python has written a book called Erebus, and Amazon Prime just came out with a star-studded miniseries called Terror.